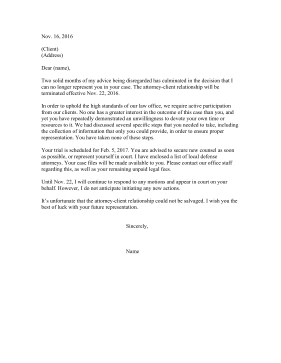 Lawyers who need to withdraw from a case can use this letter to sever their connection with a client. Two solid months of my advice being disregarded has culminated in the decision that I can no longer represent you in your case. The attorney-client relationship will be terminated effective Nov. 22, 2016. In order to uphold the high standards of our law office, we require active participation from our clients. No one has a greater interest in the outcome of this case than you, and yet you have repeatedly demonstrated an unwillingness to devote your own time or resources to it. We had discussed several specific steps that you needed to take, including the collection of information that only you could provide, in order to ensure proper representation. You have taken none of these steps. Your trial is scheduled for Feb. 5, 2017. You are advised to secure new counsel as soon as possible, or represent yourself in court. I have enclosed a list of local defense attorneys. Your case files will be made available to you. Please contact our office staff regarding this, as well as your remaining unpaid legal fees. Until Nov. 22, I will continue to respond to any motions and appear in court on your behalf. However, I do not anticipate initiating any new actions. It's unfortunate that the attorney-client relationship could not be salvaged. I wish you the best of luck with your future representation.